USDA’s Peanut Stocks and Processing Report was released January 30, 2017 for the month of December, 2016, the 5th month of the peanut marketing year. Peanut stocks in commercial storage as of December 31, 2016 totaled 4.36 billion pounds equivalent farmer stock, compared to 5.36 billion pounds last year, DOWN 18.7.0%. This total includes 3.72 billion pounds of actual farmer stock, DOWN 21.5% from last year. Shelled peanuts on hand, farmer stock equivalent, totaled 619 million pounds, UP 6.2%. Roasted stocks were 24.6 million pounds, DOWN 44.3% from same month last year. Total shelled peanut stocks showed 465 million pounds, UP 5.9% with edible grades reaching 436 million pounds, UP 5.8% from same month last year. Oil stocks totaled 29 million pounds, UP 8.2% from last year. Edible stocks of shelled peanuts by type, Virginia & Valencia stocks are at 76.4 million pounds, 16.3% LESS than last year. Runners were 341 million pounds, UP 15.2% and Spanish totaled 19.1 million lbs, DOWN 22.0% from last year. In December, shellers milled 399 million pounds, 1.2% less than last December. Commercial processors used 172 million pounds of shelled edible peanuts, 8.0% LESS than last December. Government purchases for Nutrition Program in December totaled 2.99 million lbs of peanut butter and 51,840 pounds of roasted peanuts. For the 5 months, government purchases are down 10.7% to 15.4 million pounds. SE: $475 per ton dropped to $450 per ton but plus $25 per ton for seed production, $50 per ton premium for High Oleic production. Some contract sign-up is l/2 last year’s production at $450 per ton,plus $25 per ton for seed production. Some $450 per ton reduced to $425 per ton for freight differential, hauling from long distance production areas to shelling plant. VC: $500 per ton for regular Virginias (Bailey and Sullivans, etc). $475 per ton being offered for HO Runners and $450 per ton for non HO runners, GA 06G with no restrictions. Seed production premium is usually $25 per ton. Some limits. 2016 FLEX: $400 ton base price = 0.52. For each 0.01 increase in price above 0.52, add $ 13.50 ton up to a maximum of 0.61. Present price is 0.58, which equals 0.06 increase, or a price of $481 per ton.Maximum price achievable at 0.61 is $ 521.50. $400 base. Farmers sell peanuts based on sheller web price before end of March, up to MAX $500 per ton. ($475) This includes peanuts not contracted remaining in the loan. Farmers are reminded that there are rules about peanut seed. As for saving seed, the main thing to remember is that varieties containing the patented high oleic gene may not be saved for seed by farmers. This of course includes many of the FL varieties as well as GA-09B, GA-13M and GA-14N. Looks like the prominent runner variety will be the Georgia 06G. Seed dealers indicate an increase in the price this season from $.76 per pound to $.85 per pound (cash) on the runner type peanut. If payment for seed is deferred til fall, add 3 cents per pound. No word yet on prices of Virginia type seed cost. U.S. Peanut production is estimated now by the USDA at 5.68 billion pounds, (2,842,305 short tons Farmers Stock) down 9 percent from the November forecast and down 5 percent from 2015. The FSIS graded report shows: Peanuts Inspected 2,767,035 farmer stock short tons of peanuts as of January 20, 2017. From U.S. Origin there are NO offers openly because there are high aflatoxin levels going up to 500/600 ppb with even an outline of 1650 ppb. Consequently, U.S. shellers are very reluctant to sell to Europe, especially with the new rule of testing up to 10%, so sales to Europe with EU SPECS only when necessary. Also U.S. Shellers are not keen on selling 2017 crop early position. European sources say that offered prices from USA are around USD 1700 CIF. Officials call it a market squeeze. In the U.S., peanuts are the most consumed nut. The U.S. produces around three times more peanuts than almonds, and five times more than walnuts. Meanwhile, the consumption of peanuts by far exceeds other nuts, as they are comparably cheap. In 2016, however, peanut prices rose 33%. The marketplace is being heavily squeezed by multiple factors, driving the global price higher. Production dipped in China in 2015, creating supply pressures elsewhere, as Chinese buyers looked to source their nuts from other origins. In addition, production in Argentina fell substantially in 2016, due to adverse weather during the harvest between April and May. What’s more, earlier in 2016, production in the U.S. for 2016/2017 was initially estimated at 3.2 million tons, up 17% compared with the previous season. A combination of floods and drought, however, has reduced the output and the final volume for 2016/2017 is now expected at around 2.8 million tons, still up 4% year-over-year. In North and South Carolina, production has been affected by heavy rains and floods caused by Hurricane Matthew in October. While some of the crop was harvested on time just before the heavy rains started, a lot of peanuts remained in the fields and suffered from rot, leading to a decline in yields. In addition, drought in the southeast peanut belt severely affected peanut production in Georgia and Alabama, the main peanut growing states, which account for over 60% of total U.S. output. Reduced U.S. supplies are likely to impact global peanut markets, especially if Chinese importers continue to procure from the U.S. as they did in 2016, when exports to China surged. This year, however, they look to face more challenging prices. Latest reports from China are mixed with regard to size and quality. A bumper crop has been expected in the current season, but persistent rains in the northeast provinces during the harvest reduced quality of some the crop, as the moisture levels are too high. Peanut Proud is now accepting donations of money and product for the families and workers involved with the devastating storms and tornadoes in Georgia and Mississippi. Gregg Grimsley, chairman, said all stored supplies will be gone to food kitchens in the area by the end of today. The Georgia Peanut Commission announced a $14,000 donation and the National Peanut Buying Points Association donated $5,000. Several buying points are donating a pallet of peanut butter. Companies are being contacted that might also donate product. Gregg Grimsley said that donation of money is being accepted so more peanut butter can be purchased. A full flat of 1,440 jars is $1,440; however, any amount will be accepted. Make checks to Peanut Proud, Inc., P.O. Box 446, Blakely, GA 39823. PH: 229-723-2899 or visit www.peanutproud.com and check button that reads ‘DONATE NOW”. Funds will be deposited direct to the account. Other peanut butter and peanut products are being accepted with shipments expected to roll as soon as Distribution Sites are designated. 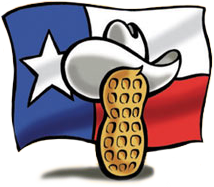 Texas Peanut Producers is sending 4 pallets of peanut butter, 5760 jars, to the tornado stricken areas in Mississippi and Georgia. President Donald J. Trump has selected Sonny Perdue, the former governor of GA, as his secretary of agriculture. That is great news for agriculture, peanuts and the United States. Things you need to know about Sonny: Sonny was born on December 20, 1946, in Perry, Georgia, to a lifelong farmer and a classroom teacher. He graduated from Warner Robins High School and earned a doctorate in veterinary medicine in 1971 from the University of Georgia. Following his service as a Captain in the U.S. Air Force, Perdue became a successful small business owner, concentrating in agribusiness and transportation. Today, those businesses have grown to include several locations across the Southeast. Perdue was a respected leader in his church and his community when he decided to enter public service. After serving on the Houston County Planning and Zoning Board during the 1980’s, he ran for the Georgia State Senate in 1990 and won. Sonny spent the next 11 years representing his Middle Georgia district in the General Assembly. Perdue left the State Senate in 2001 to begin his successful campaign for Governor, which focused on restoring public trust in state government and empowering all Georgians. As a state senator, he was often praised for tackling issues when no one else had the courage to do so and for his ability to grasp the nuances of complex problems. Sonny was recognized as a leading authority on numerous issues including agriculture, transportation, education, emerging technologies and economic development. Sonny campaigned for Governor on a platform ofrestoring public trust in state government and empowering all Georgians by eliminating undue interference by government bureaucracies. He has dedicated his administration to attracting new businesses and jobs to Georgia & improving the quality of programs that touch the lives of children. For all of his success in business and public service, Governor Perdue is proudest to serve as devoted husband, loving father, and grandfather. Sonny is married to the former Mary Ruff of Atlanta, Georgia. The couple has four children and eleven grandchildren. Additionally, Sonny and Mary have served as foster parents for eight newborns awaiting adoption. The Perdue’s attend the First Baptist Church of Woodstock, where they have taught a Sunday school class for young couples emphasizing the importance of faith in building a strong and lasting marriage. As a fellow UGA classmate and fellow 4-H’er, I know the U.S. and the world agriculture will be great again under his leadership the next 4 years. Now, you know why he will be great for America.